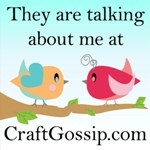 A month ago, I was contacted by a lovely lady from Michigan called Janet. She had seen my personalised fabrics on Spoonflower and asked if I could create a design with the name "Anna" for her daughter-in-law Leslie. As it turns out, Anna was the name of Leslie's mother, who had very sadly passed away a few years ago. Leslie had a chair that belonged to her mother, and Janet's plan was to reupholster it for her, as a surprise, using the fabric with her mother's name on it. I was only too happy to help with such a thoughtful and personal project. With the help of her son, they did manage to keep the secret throughout the process, and I am delighted to report that the project was a success - Leslie loves the chair! 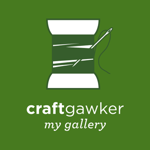 I'd like to say a big thank you to Spoonflower as well - a few years ago this type of project just would not have been possible. 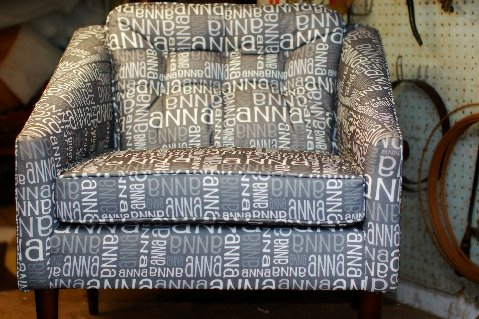 Being able to create a unique one of a kind design, and have it printed on upholstery weight fabric, is something I would have never thought we would be able to do. But it is a reality now! 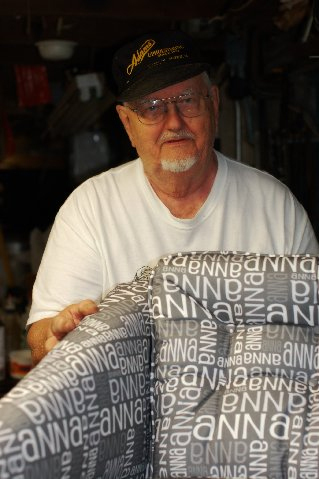 A local Michigan upholsterer, Edwin Adams, is pictured below with the chair. The care he has taken is apparent - from the piping to the fabric covered buttons. Lovely work Edwin! Everyone out there - if you can, go give your mother a hug! Best use of your fabric design for sure. Great post!